Grab yourself a hot chocolate ( mulled wine ) and get out your winter jim-jams. As much as I love dressing up for a Saturday night out, I love lounging about the house in my comfy’s on a Sunday even more. In fact, today as I type this I have a pair of brand new cashmere joggers on along with my favourite very old and battered MAMA jumper . During the colder months, I love to hibernate at home, stick on a movie & eat far too many carbs. A cosy pair of PJ’s and some nice fluffy slippers help set the scene for a relaxed day. There is nothing like having a family duvet day on a cold and wet Autumn day. Stick on all the classic Christmas movies, eat popcorn & order a Domino’s ( other brands are available ). September, October & November are the 3 months of the year I really like to relax and rewind. The madness of the summer holidays are behind us and December is one long whirlwind of parties and events before a brand New Year kicks in. During autumn I take far too many bubble baths and pamper my skin with new lotions, potions & lashings of fake tan in preparation for the Christmas party season. We all need to switch off from work and take more care of ourselves so this is the perfect opportunity to treat yourself to a few pairs of PJ’s so you feel good as you relax. 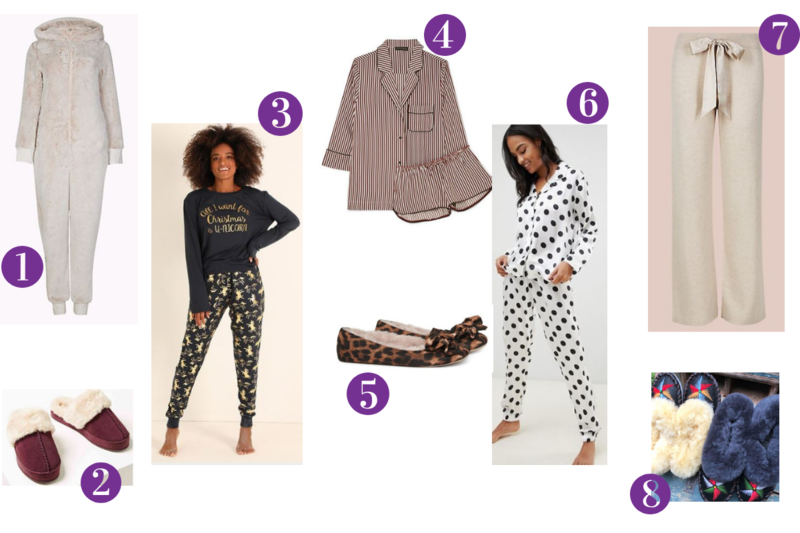 To help take the hassle out of looking here’s my personal selection of sleep and lounge wear from the high street to see you through the colder months. "Autumn’s Wildest Trend : Animal Print"